Director Shane Meadows' long-planned documentary on reunited Madchester icons the Stone Roses is finally heading to theatres this spring, albeit in the UK. The band's Facebook page confirms that the premiere of Made of Stone takes place in Manchester on May 30, and will have members of the act, Meadows (This Is England) and producer Mark Herbert in attendance. The event will be streamed live to 100 satellite-linked cinemas in the UK and will also include a question period with Meadows. Following the premiere, the flick will see a wider release across the UK June 5. It's unclear if and when the movie will make its way to North America. The film has Meadows following the band from their reunion announcement in the fall of 2011 up to a series of shows that took place last summer. Meadows told NME that "this film isn't a history lesson, nor is it a two-hour concert film. It is a film about defying the odds, sticking it to the man and telling the cynics to shut their pie-holes!" He added the documentary is about the "resurrection" of the band, and apparently proves doubters wrong that a band can't enjoy a fruitful second life. "People say that you can't recapture your youth, it'll never be the same second time round etc, but that's utter rubbish. The Roses were never allowed to reach their peak first time around so, as far as I and millions of fans around the world were concerned, with this comeback the Roses could be even greater. " A trailer has yet to pop up for the film, but you can peep comedian Nico Tatarowicz's brilliant send-up mockumentary The Second Second Coming down below. 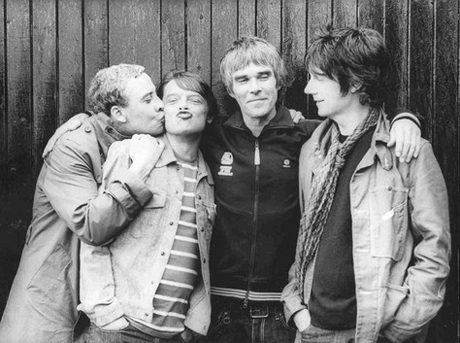 The Stone Roses "Beautiful Thing"